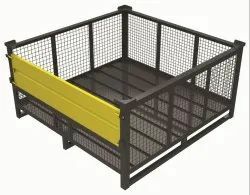 Pioneers in the industry, we offer cage bin, mild steel cage bin with castors, collapsible cage pallet, wire mesh pallet and ms collapsible cage bin from India. Cage bins are see-through type. The construction of the cage bin is using structural as well as rolled sections. Easy visual inspection of the stored products, as sides covered with wire mesh. Drop open door on one side, which allow easy access to the stored items even in the stacked condition. Four way entry for fork lift & hand pallet truck. Self-stackable up to Ground + 4 high. Different options of door available – 2 side half open-able door / Double door. Can be supplied with Castor wheels. 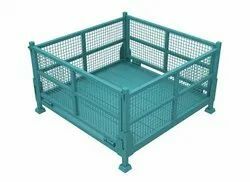 Backed by a diligent team of professionals, we have been able to manufacture and supply an excellent range of Cage Pallets. We manufacture this construction by making use of premium quality raw material and progressive technology in line with the set industry norms. To make a qualitative dispatch from our end, this construction type 2 is rigorously tested by our quality controllers against different quality measures. 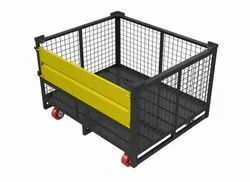 acked by a diligent team of professionals, we have been able to manufacture and supply an excellent range of Cage Pallets. We manufacture this construction by making use of premium quality raw material and progressive technology in line with the set industry norms.